Why were the Kelowna Rockets able to beat the Prince George Cougars and Kamloops Blazers on consecutive night's this weekend? While both teams were lower in the standings, the Rockets had an unflattering 4-7-2-1 record against them. The odds of winning looked bleak. So what turned their fortunes around? In my opinion it happened at the conclusion of Friday's first period. Let me explain. The Rockets struggled mightily in the opening 20 minutes against the hapless Cougars, who built up a 3-1 lead. When the buzzer sounded to end the period, leading scorer Kyle Topping bee-lined to the dressing room. No words were exchanged with teammates. He didn't stick around to pat starting goaltender James Porter on the pads as a physical form of encouragement. Instead, the 19 year-old quickly exited the ice and swiftly made his way to the Rockets dressing room with a look of embarrassment. The 11th round WHL bantam pick, who has transformed into the teams top point producer, had too much pride to accept his team being shown up by the bottom feeder in the BC Division. Topping's body language told his teammates the effort was unacceptable and no verbal cues were needed. 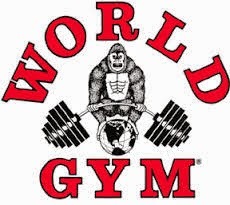 I thought it was awesome. I loved the passion, the want to win and the pride to succeed when it appeared others didn't care. While it looked like a small detail at the time, Topping's team came out with an energetic effort from there in earning a come-from-behind 4-3 win. 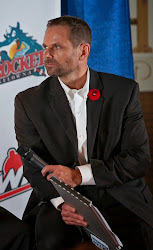 The Rockets would score three straight goals against the Cougars, who earlier in the week made a coaching change by firing Richard Matvichuk and replacing him, on an interim basis, by general manager Mark Lamb. In aiding Topping's cause, slow to anger teammate Kaedan Korczak took matters into his own hands with an early third period scrap with Cougars forward Josh Maser after the 19 year-old delivered an unpenalized high hit on Rockets leading goal scorer Nolan Foote. 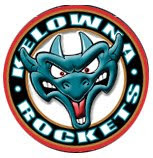 Topping's silent temper tantrum and Korczak's first fighting major of the season had the Rockets heading to Kamloops a night later in a tilt that saw the two teams separated by just 4 points in the standings. Despite failing to beat the Blazers on the road this season, Mark Liwiski opened the scoring in what turned out to be a dominating 40 minutes of play. Building up a 3-1 lead, the Rockets stuck to defensive hockey in the third period before sealing the game with an empty netter from Lassi Thomson. Those two wins on the weekend gives the team 23 victories, eliminating any chance that the 2018-2019 edition of the Kelowna Rockets will be pinned with having the fewest wins in franchise history. That mark for futility, at least for another season, will be held by the 2006-2007 team that won only 22 games and missed the playoffs for the only time in franchise history. What's with Mark Liwiski? The rookie forward scored the game winner Friday and opened the scoring Saturday in Kamloops. The 17 year-old, who doesn't turn 18 until August, has found his scoring touch. With 7 goals this season, five of them having come in his last 10 games. That secondary scoring is a welcome sign at just the right time. On too many nights, TMF is carrying the heavy mail offensively. TMF stands for Topping, Mattson and Foote. Leif Mattson, who has been one of the teams offensive leaders this season, snapped a 12 game goal scoring drought Saturday with his 19th of the season. Mattson's goal came in the second period to make it 3-0 after Blazers goaltender Dylan Ferguson attempted to clear the puck up the middle of the ice. Connor Bruggen Cate rejoined the team after serving a two game suspension for actions in a game against Kamloops the weekend prior. Fans routinely booed him every time he touched the puck. Blazers d-man Montana Onyebuchi did not play in the game after being slapped with a two game suspension for attacking Bruggen Cate. The 19 year-old will have to deal with the Blazers pugilist when the two teams meet again later this month. The win in Kamloops was the first this season after going 0-2-1 in three attempts at Sandman Centre. The last win, prior to Saturday night in Kamloops, was a 4-2 victory last season when Dillon Dube scored once and added an assist in the two goal win. The power play struck for two goals Saturday night against the Blazers. It marked the first time the team had manufactured a goal with the extra man after going 0 for 15 in their previous four road games. Lassi Thomson was named the first star in the 4-1 win in Kamloops. The 18 year-old now has 15 goals in his rookie season with four of them coming in his last five games. The franchise record for goals by a European born defenceman in a single season is held by Thomas Slovak, who scored 18 goals in the 2002-2003 season. Might Thomson eclipsed that total? Hard to believe but the shoot first blue-liner went 22 games without a goal earlier this season. The Rockets road record against BC Division teams improved to 4-6-2-1. It was only the third home ice loss for the Blazers against a BC Division team this season. Liam Kindree missed his 7th straight game Saturday night with a broken nose. Ted Brennan also didn't play after being hurt January 19th against the Prince Albert Raiders. Rookie forward Al Swetlikoff had a good week with 2+3=5 in three games including two goals Wednesday in a 4-3 loss to visiting Spokane. The 17 year-old had two assists in Saturday's win in Kamloops. The Rockets have just 6 road games left in the season. Three of those six will be played next week, with games Monday February 18th and Tuesday February 19th in Victoria before traveling to Spokane February 22nd. The team closes out the road schedule in March with one more stop in Kamloops and two games in Vancouver (Langley).